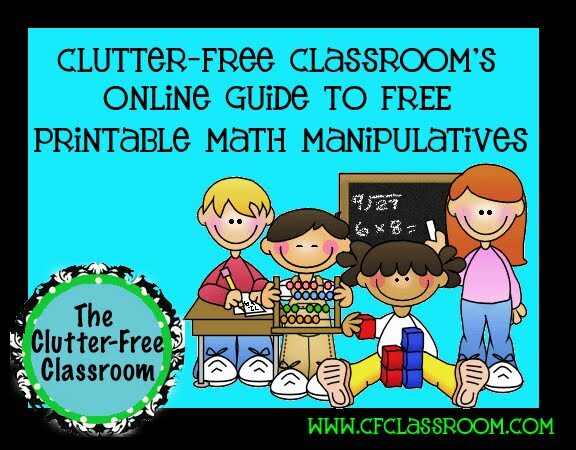 If you are just joining us, you'll want to start here or check out my Clutter-Free Guide to Organizing and Managing Your Classroom .This week's Clutter-Free Classroom Project Challenge has you organizing your math materials. We've been organizing math manipulatives, but what if you don't have many manipulative to organize? Perhaps you are just starting out or maybe school budgets don't allow for an expansive collection. Have you ever wished your students had resources to use at home? Well, you've come to the right place. Below is a collection of links to FREE printable math materials and resources. They would be great to share with your students' families so they can access them at home. OMG! I heart this site. I love how it is organized in alphabetical order. I like the quality of the resources. I click my heels together because it is FREE!! XY-Blocks – Set of X, X2, XY, Y, and Y2 blocks. I purchased these small plastic containers at The Dollar Tree. I believe there were 10-12 in the package. 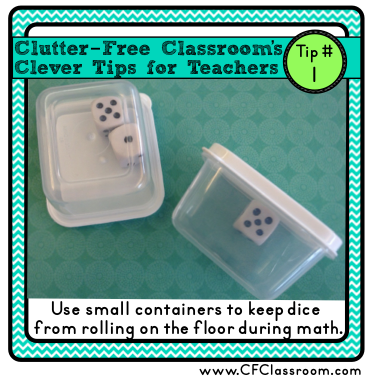 They are perfect for math games during guided math and math workshop rotations because they prevent the dice from rolling off the desks and tables and onto the floor. They also make put an end to tossing the dice high in the air (you know what I'm talking about). The students give the container a little shake and turn it over to see what they've rolled.